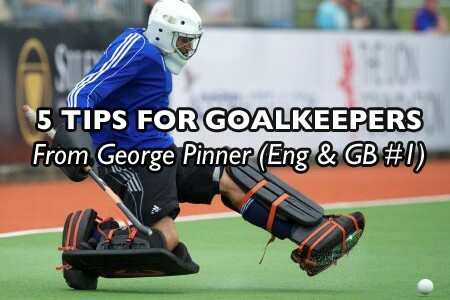 I have recently had quite a few requests for field hockey goalkeeper tips and although I can help goalie’s with a large part of their game (particularly when it comes to the mental and physical demands), I am no expert goalkeeper so who better to get tips from than England and Great Britain’s number one goalkeeper; George Pinner. 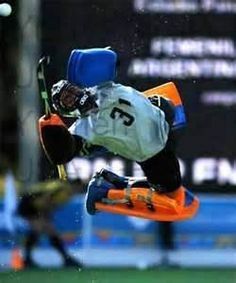 I started playing hockey when I was 8 years old but didn’t start playing in goal until I was 10. I only went in goal for the first time because I was unwell that day at school and so couldn’t run around! How long have you been involved in GB / England Hockey? The first time I played for England was in the u16 age group, when I was 15 years old. I then proceeded to go through the ranks of the junior international set-up before making my senior Great Britain debut in 2007, aged 20. I made my England debut in 2009, but it wasn’t till 2011 that my international career really started to take off. 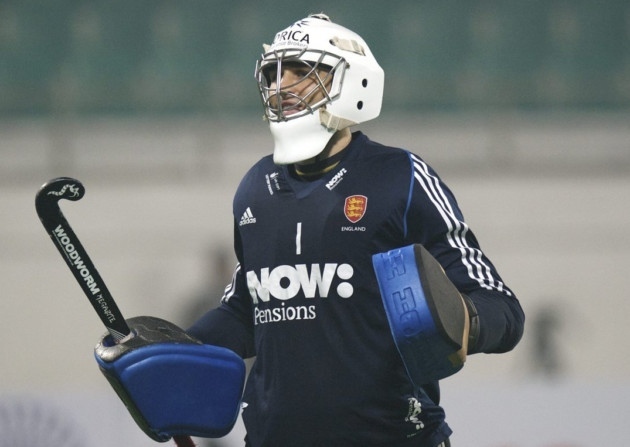 I went to the 2011 Champions Trophy as the reserve GK and was then picked as the reserve GK for the 2012 Olympics. 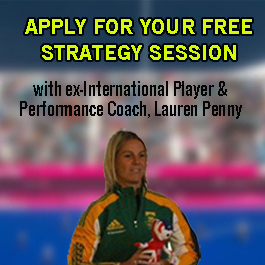 Post the London Olympics I have managed to establish myself as England and GB’s 1st choice GK and I plan on holding on to the position for as long as possible. You should try to always stay on the balls of your feet. This helps you keep the ball flat when kicking and making foot saves but is also key when diving or smothering to ensure you don’t rotate back. Your head is very heavy so is key in keeping your weight forwards. 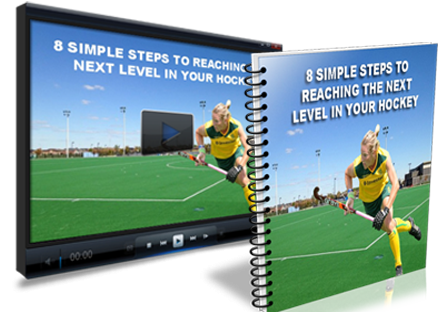 Find a height that is comfortable and allows you to be able to move and react to high shots, whilst being able to drop and extend if you have to dive. If you keep your hands low and by your side you will struggle to get them up to save high hard shots. 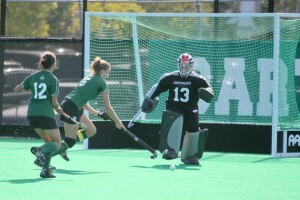 Too many GK’s use the front face of their leg guards or over rotate and end up on their front. Whilst there will always be the odd save when you finish in this position, try to groove the correct side on technique so it becomes natural. This sounds obvious but when you have someone nailing the ball at you from the flick spot your natural reaction can be to tense up and make yourself smaller. If you stay nice and big and watch the ball you will be amazed and how many you naturally react to and save. Plus it means when the forwards mis-hit a shot you are in a position to save it. The same applies against flickers at PC’s. A lot of players have good disguise on the corners, so try to just stare at the ball and wait for them to release it before you react. Try not to predict or get fooled by their body movement. 5. 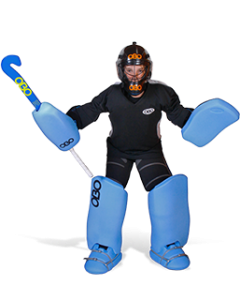 Enjoy being in goal! 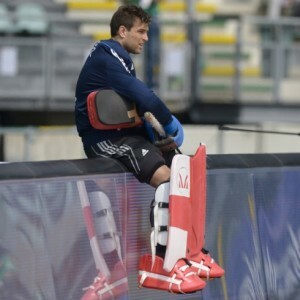 Happy goalkeepers are good goalkeepers! Whilst no one likes letting in a goal, you have to accept that you won’t save everything. Don’t get down by goals that go in, or hung up on a shot you should have saved. Clear you mind and focus on the next one, you never know how the game will pan out and you might have the chance to be the hero and save a stroke in the last minute. 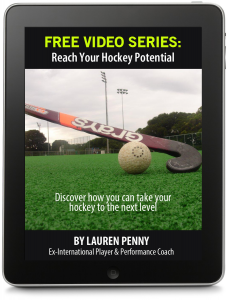 If your still beating yourself up over an earlier goal you won’t be in the right frame in mind to make that save. I have previously spoken a lot about the importance of your mindset if you want to play your best hockey and this is especially important for goalkeepers, because you need to be the most composed of all positions especially as the margin for error is the lowest.